Banff National Park is a treasure. Canada’s first national park and part of a UNESCO World Heritage Site (along with the other Canadian Rocky Mountain national parks, Jasper, Yoho and Kootenay), it is a place of unparalleled natural beauty, with a rich history and an amazing array of recreational possibilities. It also has crowds. Drive from Calgary to Banff on a summer Saturday morning and you will join an almost unbroken stream of rental cars, RVs, pickup trucks towing boats and just about any other vehicle you can think of. The most popular spots along the Trans-Canada Highway — Lake Louise, Moraine Lake and Johnston Canyon — are fair bursting at the seams with people, something that has conservationists concerned. Even the backcountry seems more crowded than ever. To use the backcountry in a national park you have to purchase a “wilderness pass” from Parks Canada and reserve a site at whichever backcountry campground you’re planning to stay at, but there are certain classic backpacking trips (the Skyline Trail in Jasper, the Egypt Lake and Skoki areas in Banff) where it can be extremely difficult to find an available backcountry site. Last year, we were hoping to backpack into the remote Devon Lakes, the headwaters of the Clearwater River. The most direct way to get there is via the very popular Fish Lakes campground. It was fully booked (of course) on the dates we wanted. So instead, we hiked into the even more remote Castleguard Meadows, a stunning area on the south side of the Saskatchewan Glacier and Columbia Icefields. We saw nobody in five days. But the price of solitude was hiking an “unmaintained” trail, which meant lots of route-finding and occasional bush-whacking. Another part of Banff’s backcountry where you can avoid crowds, but without the route-finding challenges of the Castleguard, is the “Front Ranges.” As the name suggests, the Front Ranges are the first chains of peaks to the west of the prairies and foothills, in the eastern part of the park. After the Trans-Canada highway leaves Banff townsite, it bends to the northwest, so in Banff the Front Ranges are generally understood to mean the area east/northeast of the highway. Horse outfitters have been using the Front Ranges for as long as Banff has been a park, and its broad river valleys were used by Indigenous Peoples for centuries before that. While the Front Ranges don’t have the heights and glaciers of the Continental Divide west of the highway, it is an area of incredible beauty and definitely no crowds. In the early 1990s, I did a 160-kilometre backpack loop through the Clearwater and Red Deer River valleys with John Tuckwell, a Fellow of The Royal Canadian Geographic Society, and we saw virtually nobody the entire trip. The Front Ranges are also where Parks Canada recently reintroduced bison into the Rocky Mountains. Specifically, the bison were brought to the Panther River valley, which is the first major valley south of the Red Deer River. So this year, my colleague Marco Baldasaro, RCGS Fellow Greg Lyndon and I planned a week-long trip through the Front Ranges that would have taken us north from Banff into the Panther Valley in the hopes of seeing some bison, then north to the Red Deer River. From there, the plan was to go west to the Skoki area and finish at Lake Louise. A week before we left, we learned that Parks Canada had closed the Panther River valley to hikers because of the bison. As a result, we adjusted our itinerary to follow a “scenic route” between two of Banff’s three ski areas. August in Alberta was marked by significant smoke from forest fires in B.C. On our first day, the smoke was so bad we could barely see the sun, let alone the mountains. Fortunately, the smoke started clearing our second day and by our third day, we were enjoying brilliant blue skies. 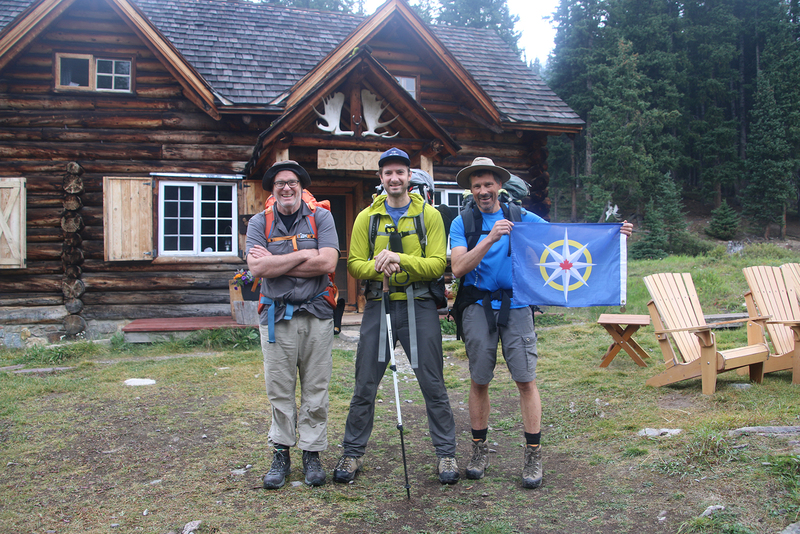 Gavin Fitch, right, with hiking companions Marco Baldasaro, centre, and Greg Lyndon at Skoki Lodge. Our route took us north from Mount Norquay up the Forty Mile Creek valley, over Forty Mile Summit, and down to Flint’s Park, where we spent our second and third nights. Located at the confluence of three broad valleys (the Cascade River, the north branch of the Cascade and Sawback Creek), it is one of Banff’s most remote backcountry campsites, as it at least a two-day hike to get there from any direction. We had it all to ourselves. While at Flint’s Park we did a day hike to North Fork Pass. It is straight north from Flint’s Park and from the pass you look down into the upper Panther River valley. The view from the pass down into the Panther valley is awesome–a steep drop into a very remote and lonely-looking valley. I took out my binoculars and searched diligently, but alas saw no bison. Badger Pass is one of Banff’s highest trail-accessible passes (close to 2,600 metres) and was a serious climb: over 700 metres from Flint’s Park. It quickly took us from the lush valley bottom of the upper Cascade River through the subalpine and alpine, to a notch of rock and shale between two peaks. Fortunately we lucked out with the weather: it was sunny and glorious at the pass. The view back towards the Cascade valley, a sea of jagged and serrated peaks, confirmed why this range of mountains is called the Sawback Range. From Badger Pass we dropped into the Johnston Creek valley, where we spent our fourth night. Once again our campsite was located in a broad, open valley affording amazing views north and south. Under clear skies the sunset was spectacular. At that point, we were only about three kilometres below our next pass, Pulsatilla Pass. The climb over the pass the next day was mercifully short and we had a wonderful lunch at Pulsatilla Lake, on the other side of the pass. From there, we carried on to our next stop: the “Wildflower” campground. The name had us imagining it would be in meadows, but it’s actually in a small clearing in an old growth forest and is named for Wildflower Creek, which roars by — a beautiful and peaceful spot. 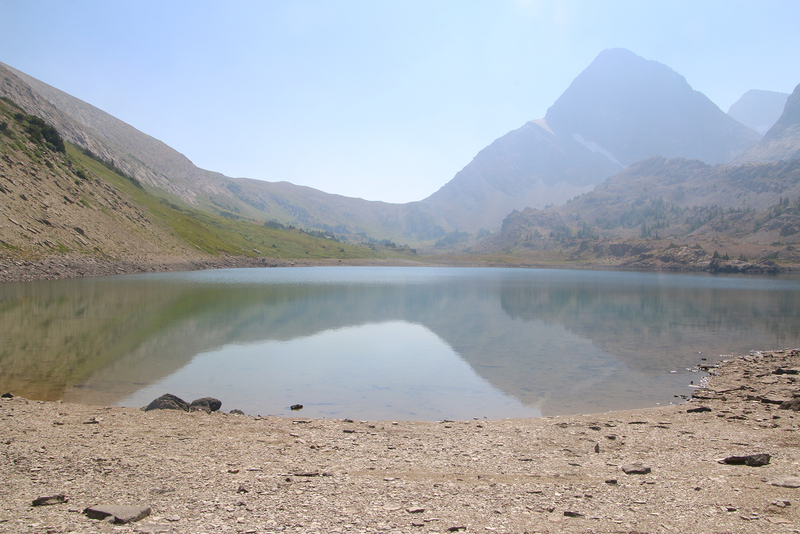 The next day, we carried on to the Skoki Valley and our next campsite at Merlin Meadows. Skoki Lodge is one of Canada’s great backcountry lodges (it is a National Historic Site). Our route took us past the Lodge and we fortuitously arrived during afternoon tea, which the Lodge offers up not only to guests but also to any smelly, long-distance hiker who happens to show up with a credit card. Fresh vegetables and a couple of beers were an absolute treat. After five blissfully quiet nights, Merlin Meadows — a comparatively large and popular backcountry campground — seemed ridiculously busy. As we had at Skoki Lodge, having been on the trail for almost a week, we felt disconnected from our fellow campers, who were on short, one or two-night trips. It was also sad knowing it was our final night. To boot, the smoke had blown back in. On our seventh and final day, we did what is one of the classic hikes in Banff: from Skoki over Deception Pass to Lake Louise. By then, our packs were light and our legs were strong and we motored over the pass, past Boulder Lake and down Boulder Pass. We ate the small amount of lunch we had left at the “Halfway Hut” before hiking the seven kilometres down to and past the Lake Louise ski area, passing under the Larch chairlift. It was a wonderful hike: no bison, but amazing scenery and, best of all, some real solitude. If you want to avoid the crowds in Banff, block off at least four to five days, and head north from Banff into the Front Ranges. You won’t soon forget it. Gavin Fitch is a Calgary-based lawyer and the President of The Royal Canadian Geographical Society.